- To understand that the Prophet was sent to teach us how to behave with the best manners as taught by Allah in the Qur’an. Allah has sent the prophet to us as an example and role model of who to copy and be like so that we can have the best of manners. Good manners help everyone get along together. They make the world a better place to live because people start to think and care about others and not just themselves. Based on the book Have you filled a bucket today? Imagine that everyone carries an invisible bucket. You feel happy and good when your bucket is full and sad when your bucket is empty. When you say or do something kind to others, you fill their bucket with happiness and your bucket too! It feels great. When you do something wrong and have bad manners, you dip into the bucket and take out some of the good feelings. By upsetting people, we empty their bucket and our own. We both feel sad. All day long, we are either filling up or dipping into each other’s buckets by what we say and do. Prophet Muhammad was the best bucket filler! He taught and showed us why it’s so important to have good manners and to think of others. You feel good when you help others feel good. 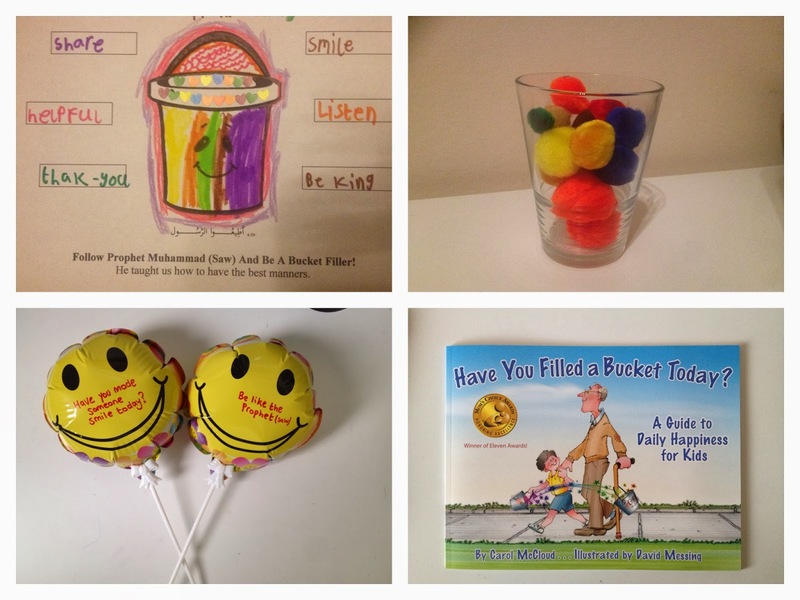 By being a bucket filler, you can make your home, your school and your world a better place. Make a craft bucket using a paper cup and decorate/label. You could also use a glass and pompoms to visually display the bucket filling concept. Each time child demonstrates good manners, praise and reinforce the bucket filling principle. When the bucket is full, reward if/as you wish. Acts of Goodness: Continue the concept by encouraging other bucket filling activities. Eg acts of kindness for others, writing thank you notes, helping, picking litter, giving charity, giving compliments etc.